The Zero Belly Diet is the latest weight loss plan developed by David Zinczenko who is popular for his Abs Diet books as well as Eat This Not That. In his newest offering, he shows dieters how they can turn off their fat genes in order to lose up to 16 pounds in just 14 days. This book was developed from Zinczenko’s many years studying belly fat to understand how it forms, the health implications it has, and how to get rid of it. David Zinczenko divides the Zero Belly Diet into two parts and here is a basic summary of what you can expect to find in each section of the book. David starts out this section of his book by explaining why belly fat is so harmful to your health far beyond how it looks. He explains how excess belly fat harms both your heart and your brain. He then covers the genetics behind belly fat and discusses the latest research into the genes responsible for storing belly fat. Turn off belly fat storing genes. What foods to avoid that promote fat storage. What foods to eat to stop fat storage. How balancing intestinal flora is key to the process of eliminating belly fat. Part two of the Zero Belly Fat diet is all about the diet and fitness recommendations needed to put this plan into action. The diet basically consists of 3 meals, one “Zero Belly drink” and one snack per day. The diet is not gluten free or vegan, but it includes very low amounts of gluten and a very high proportion of plant-based foods. Dieters should limit alcohol to no more than one drink per day, especially during the initial six-week stage of The Zero Belly Diet. Zinczenko also includes a 7 day cleanse as part of his diet. This cleanse is designed to jumpstart results and help dieters to break free from certain food addictions. The exercises recommended in the Zero Belly Diet consist of whole body exercises and core strengthening exercises, but with no sit-ups. Zinczenko notes that abdominal fat can’t be targeted with exercise, so he believes the whole body approach is much more effective. The book includes all the exercise routines recommended. 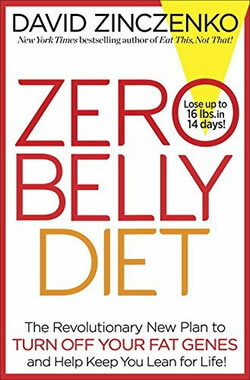 The Zero Belly Diet retails for $26 and there is also an additional Zero Belly Cookbook available for $28. The Zero Belly Diet’s author has years of experience and expertise helping people lose weight. Promotes healthy foods and a healthy lifestyle. Recognizes the benefits of consuming primarily plants. Offers scientific evidence regarding the harm belly fat can do to one’s health. Discusses the role hormones can play in fat storage. Cleanses have been debunked by many health experts as unnecessary. For those extremely overweight, fat may not leave the belly first. Calorie restriction will be challenging for some. Some dieters may have trouble limiting foods containing dairy, sugar, and wheat. The Zero Belly Diet offers a lot of great advice regarding a healthy way to slim down and get rid of belly fat. However, the greatest determent whether or not belly fat will be lost is maintaining a calorie deficit. A person must consume fewer calories than their body uses for any fat loss to occur. I’m trying yo figure out the serving sizes. I know on the cleanse days it dhows 5oz. ___, but does EVERYONE eat the SAME amount no matter your weight, gender…? what is in the nightly pill ?